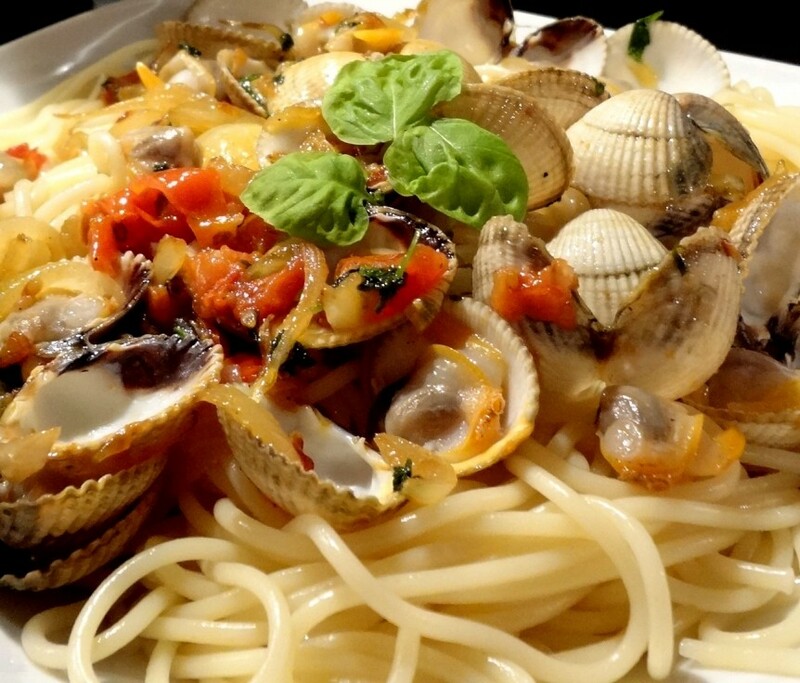 This delicious Venetian clam pasta started life as peasant food, and has become an Italian classic. Put a pan of water on to boil. While that’s happening, sort through your cleaned clams and if there are any that aren’t tightly closed, give them a sharp tap. If they don’t close, throw them away. Put a large pan with a lid on a high heat and let it heat up. Finely slice the parsley stalks, then put them to one side and roughly chop the leaves. Peel and chop the garlic, quarter the tomatoes and get your wine ready. Add the pasta to the boiling water with a good pinch of salt and cook according to packet instructions until al dente. About 5 minutes before your pasta is ready, get ready to start cooking – you'll have to be quick about this, so no mucking about! Put 4 generous lugs of extra virgin olive oil into the hot pan and add the garlic, parsley stalks and a good pinch of salt and pepper. Crumble in the dried chilli and add the chopped tomatoes. Stir everything around constantly and just as the garlic starts to colour, tip in the clams and pour in the wine. It will splutter and steam, so give everything a good shake and put the lid on the pan. After about 3 or 4 minutes the clams will start to open, so keep shuffling the pan around until all of them have opened. Take the pan off the heat. Get rid of any clams that haven't opened. By now your pasta should be just about perfect. Drain and add to the pan of clams along with the parsley leaves and an extra drizzle of extra virgin olive oil. Stir or toss for a further minute or two to let the beautiful seashore juices from the clams be absorbed into the pasta. Serve right away. No sane Italian would eat this dish without some fresh hunks of bread to mop up the juices. Beautiful! PS The first time you make this it will be good, but you might find things don't come together exactly at the right time. But don't worry, this dish is all about confidence and the more you make this, the more you'll find the pasta and clams are ready and perfect at the same time. And then it will be great!